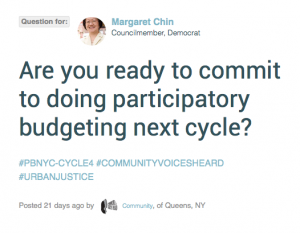 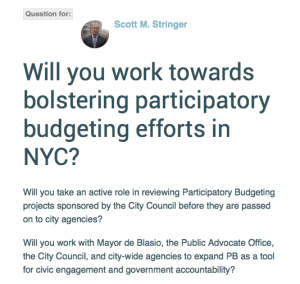 Announcing our extensive question campaign for Participatory Budgeting in New York City! 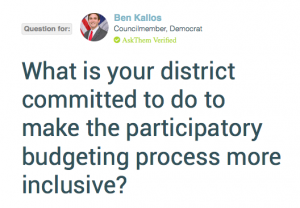 We’ve worked closely with the Participatory Budgeting Project and the grass-roots organizing group, Community Voices Heard, to build awareness for the budgeting process, encourage district adoption, and increase the diversity of participants. 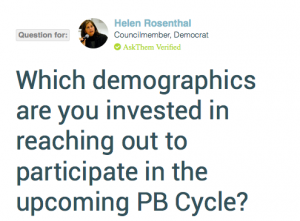 Many thanks to Christopher for highlighting the power of PB to represent the needs of underserved new yorkers including at-risk youth, disenfranchised individuals, and low-income families.